So said Johnny Rivers in the theme to the ’60s show Secret Agent. Mark Riebling draws a far different picture in his book Church Of Spies in which most of the subjects know each other and use their real names. When I first heard of the book I thought it was some kind of silly Dan Brown novel with lots of nonsensical theories about cloak and dagger plots. It isn’t that at all. It is a short, heavily footnoted (end notes, actually) page turner. The book is only 250 pages but has an additional 125 pages of notes, index, and sources. Many of the people mentioned in the book will be familiar – at least by name – to most people; Pope Pius XII, Allen Dulles, Dietrich Bonhoeffer, Reinhard Heydrich, Heinrich Himmler, Hans and Sophie Scholl and of course Adolf Hitler. 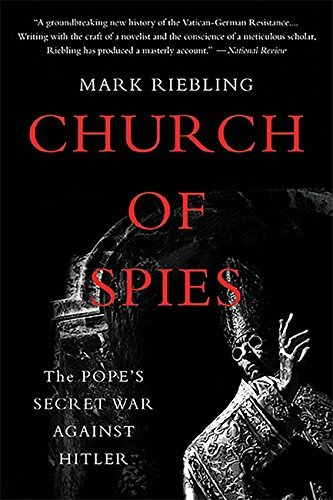 Less well known are people like Gereon Goldmann, a Franciscan seminarian who was drafted into the Waffen SS and later wrote about his exploits in The Shadow of His Wings, Rupert Mayer, a Jesuit who won two Church of Spies: The P... Mark Riebling Best Price: $2.44 Buy New $5.00 (as of 02:10 EDT - Details) Iron Crosses in WW I, lost a leg for his efforts and was later jailed for opposing National Socialism, and Josef Muller the man who is pretty much the book’s protagonist. Muller, whom the Nazis considered “the best agent of the Vatican Intelligence in Germany” was a figure that sounds like the product of a spy thriller writer’s imagination. As Riebling relates, he was arrested by the Gestapo for trying to kill Hitler. Many times the plotters would pass on intelligence about Hitler’s plans, but he would change them and consequently their intelligence would be wrong. Several attempts on Hitler’s life failed because of timing, equipment failure or because Hitler seemed to have a diabolical guardian. One time a bomb actually went off next to Hitler, but he survived. Another time the plotters could have shot him at a meeting, but instead planted a bomb on his plane disguised as a bottle of cognac. The bomb failed to go off which illustrates the maxim that a bird in the hand is worth two in the bush. Although this is not an apologia for Pius XII, he comes off looking very good. His detractors waited until he was safely dead before claiming that he didn’t speak up against Hitler. Nobody ever denounces the Archbishop of Canterbury, the Methodists, the Dalai Lama, Zoroastrians or the Baptists for their “silence,” only Pius XII. Pius coordinated with Jewish rescue groups to help them escape Europe, funneling money through various countries, but the groups would not accept Catholics of Jewish descent so he could do little for the latter. One of their plans that has backfired badly was a common currency. Muller theorized that if Europe was linked economically it would prevent future wars. They probably didn’t foresee Europe becoming a unified mega-state in which national borders mean little or nothing and where the whole world seems to be entitled to move there. Considering the number of plotters and their positions – many were high in the military – it is surprising that they were not discovered sooner. The book also shows that there were many who wanted Hitler gone, but were afraid to act or thought that fighting against their own government was treasonous. Seeing as how many of the plotters were captured and killed it is understandable why they didn’t want to get involved. That’s the way most people are everywhere. As Johnny Rivers sang, “Odds are he won’t live to see tomorrow,” many of them didn’t, but a few did and Mark Reibling has written a riveting account of them. Reprinted with permission from Different Bugle. Chris Sullivan [send him mail] owns a welding shop in Atlanta, Georgia and is currently working on design of exercise equipment. Visit his blog.